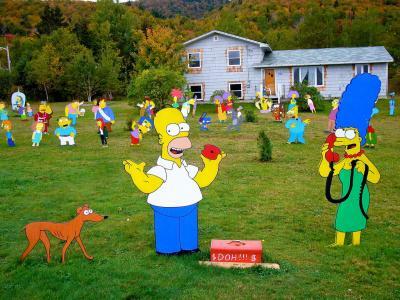 The Simpsons is an American sitcom that shows middle class lifestyle in cartoon form. The half-hour episodes take place in and around the fictional town of Springfield and make fun out of American culture and society. Since the show started in 1989 the Simpsons have been broadcast over 500 times. This makes it the longest running sitcom in American television history. In 2007 a full-length movie, The Simpsons Movie, made over half a billion dollars. The Simpsons has won many prizes, concluding the Emmy Awards. In the year 2000 Time magazine named it the best television series of the century and the cartoon characters of The Simpsons received their own star on Hollywood’s Walk of Fame. The Simpson family consists of 5 main characters. Homer is the rather clumsy, beer-drinking father. He works at a nuclear power plant in Springfield and is married to Marge Simpson, a typical American middle class housewife. The couple has three children. Bart is a ten-year old who constantly gets into trouble. Lisa is a highly intelligent eight-year old who has become a vegetarian and a Buddhist. Maggie, the family’s baby, is often shown with a pacifier. The Simpsons have two pets, a dog named Santa’s Little Helper and Snowball, a cat. Even though the series focuses around animated characters, many human celebrities have starred on The Simpsons in the past, for example, Bill Clinton, Tony Blair, Tom Jones or Mel Gibson. The comedy centers on a few major themes. Homer’s work in a nuclear power plant opens up the topic of our environment for discussion. Bart and Lisa are often shown in their school life where educational problems arise. Homer and Marge try to raise their children as best as they can but, as in many typical families, do not always succeed. The series also makes political comments and criticizes how the government and large corporations exploit the normal worker. The program has been very successful around the world. It is watched by millions of people in over a hundred countries. The Simpsons have triggered a merchandising industry revolving around T-shirts, DVDs, video games, a theme park and books. Anglická četba: Simpsonovi. Procvičte si čtení v anglickém jazyce v článku o známém seriálu Simpsonovi. Čtení v angličtině rozšiřuje slovní zásobu.